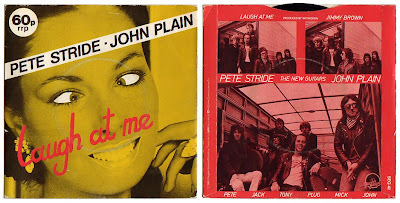 MOTHER'S CHILDREN: PETE STRIDE & JOHN PLAIN - LAUGH AT ME 7"
PETE STRIDE & JOHN PLAIN - LAUGH AT ME 7"
My first installment is the great PETE STRIDE & JOHN PLAIN - "Laugh At Me" 45. I picked up this for $1 at Legend Records here in Ottawa a few years ago. You might already know that Stride was the guitarist for THE LURKERS and John Plain was a guitarist for THE BOYS. The side-project released this amazing two-song single in 1980 and an o.k. LP which I managed to pick up in LA. The band is also credited as THE NEW GUITARS. 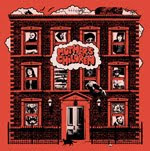 Certainly named after the LURKERS song "New Guitar in Town" which John Plain co-wrote. The choice A-Side "Laugh at Me" is absolutely fantastic and right up there with 3rd and 4th album era BOYS. I only recently heard the original version by SONNY (of SONNY & CHER), It's a REALLY good folk/pop manifesto, but STRIDE & PLAIN totally made it their own and added a heart-stopping riff to the mix. The B-Side, "Jimmy Brown" is an alternate version of the single by the BOYS. The chorus is the same but the verses are completely different. Not as good as the original but still worthy of a few spins. 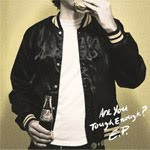 (A Side) "Laugh at me"
Hello, Can you re-up this single?